Welcome! If you are new here, I am glad you stopped by. If you are a long time follower, thank you for your faithfulness! 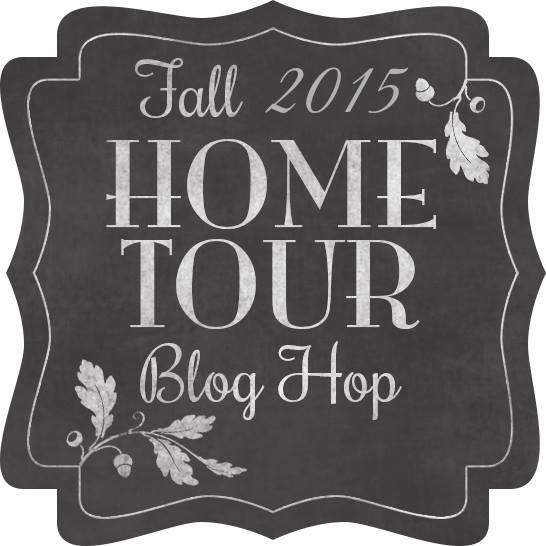 Today I am lucky enough to be a part of a Fall Home Tour Blog Hop. 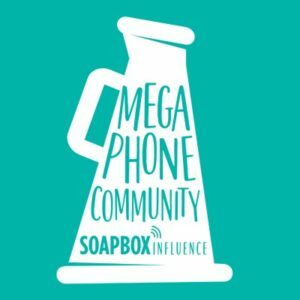 It is going to be full of great ideas and creativity. 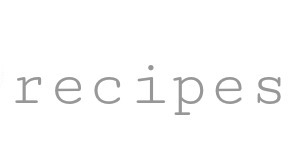 Don’t you just love how everyone has a different eye and perception for designing? 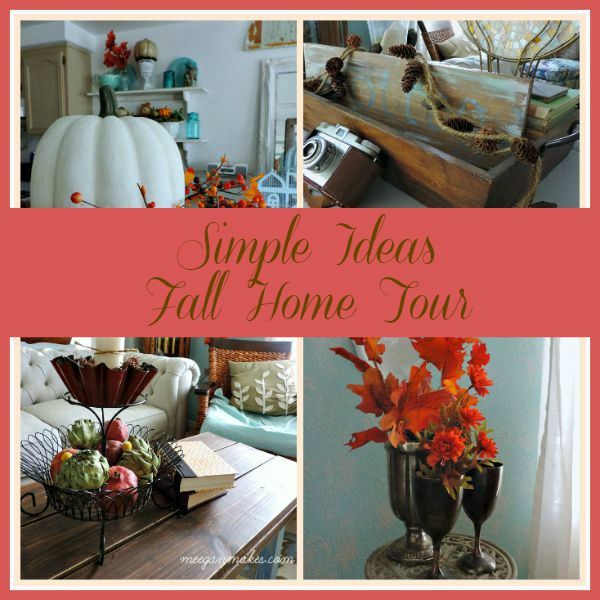 I have some Simple Ideas For Fall to go along with our Fall 2015 Home Tour Blog Hop. 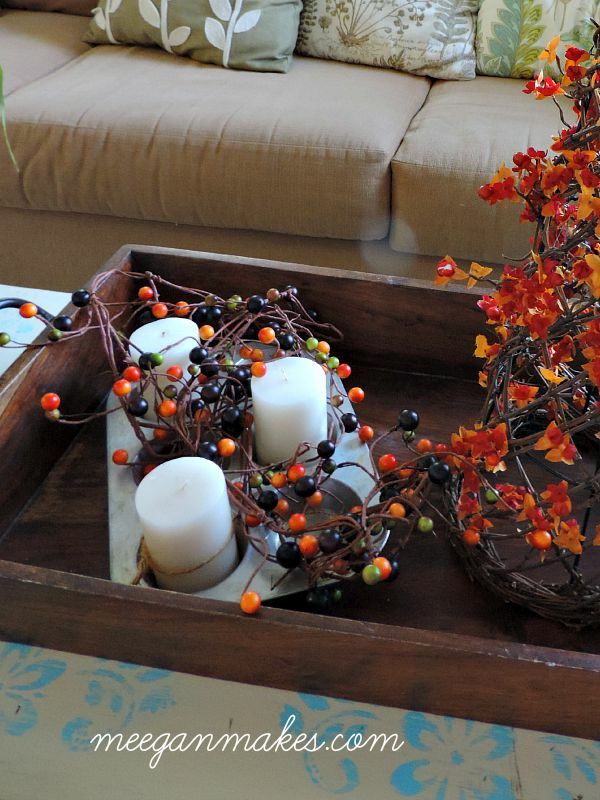 I love decorating for Fall. Especially using what I already have. 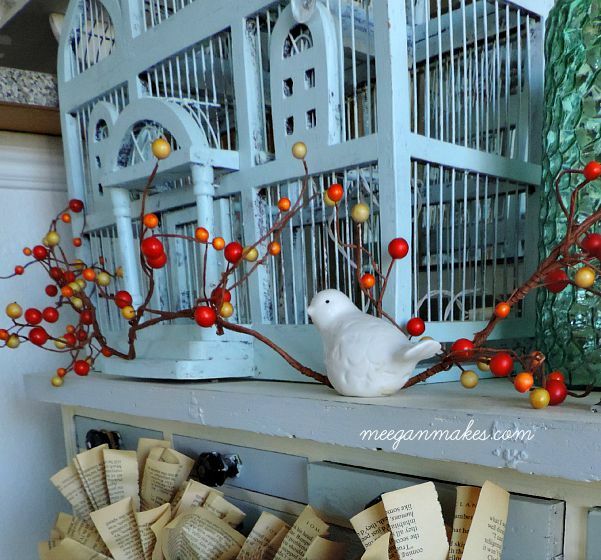 Whether it is vintage book pages, old cake pans, muffin tins, or even a real bird’s nest, I like to decorate with all of it. If you didn’t know already, we live in a small condo in Las Vegas. 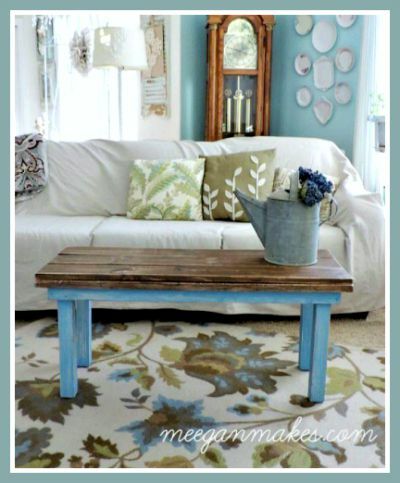 I try to make it as homey and give a cottage feel as much as I can. 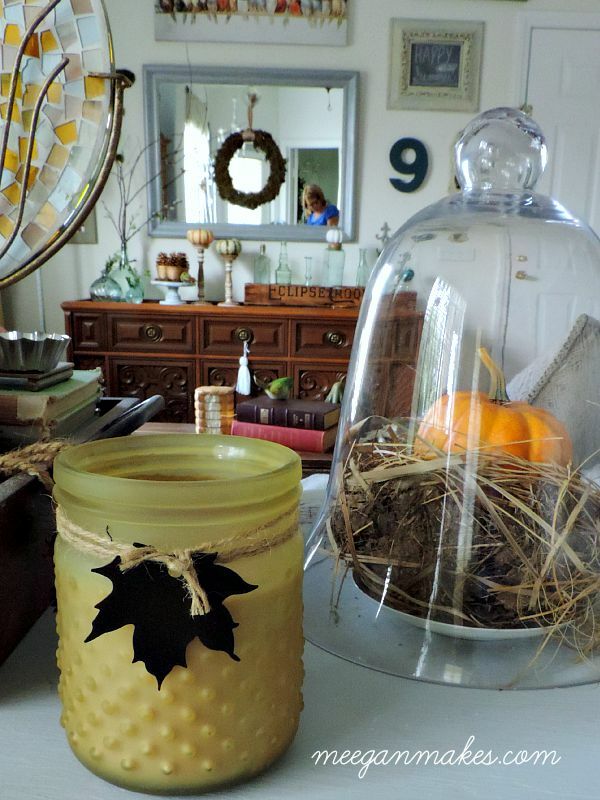 Something as simple as a pillow, a wreath, and some bittersweet gives our tiny porch a welcoming Fall feeling. I found my most favorite Fall candle scent-Vanilla/Cinnamon at Kirklands. I haven’t been able to find it for a few years. Yay! Now it smells like Fall. 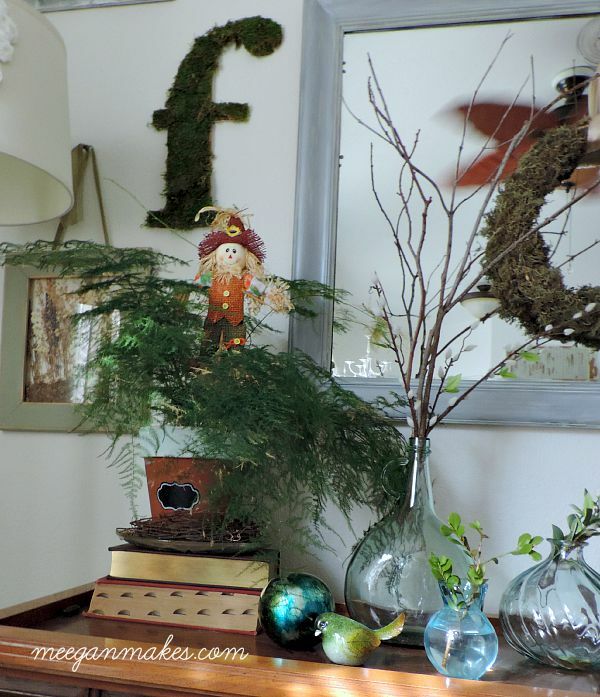 And how cute is the tin leaf tied with the jute? 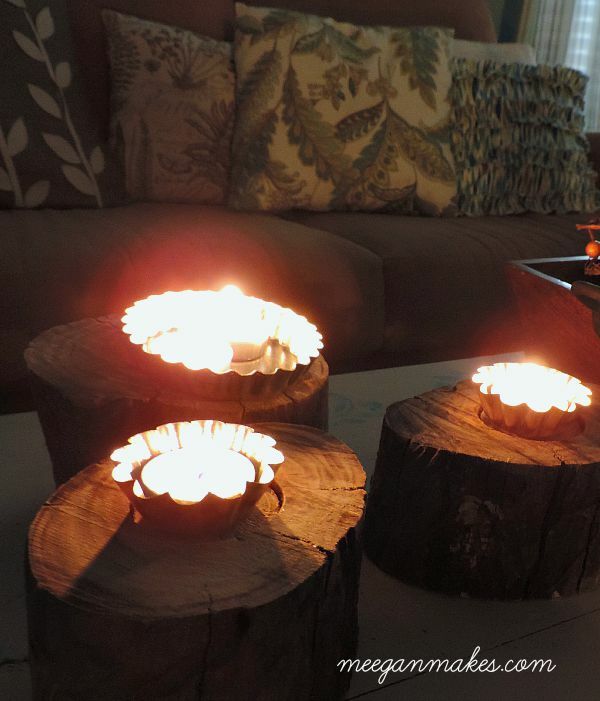 My tea lights are resting in tart tins on real wooden stumps. I love how they look at night. 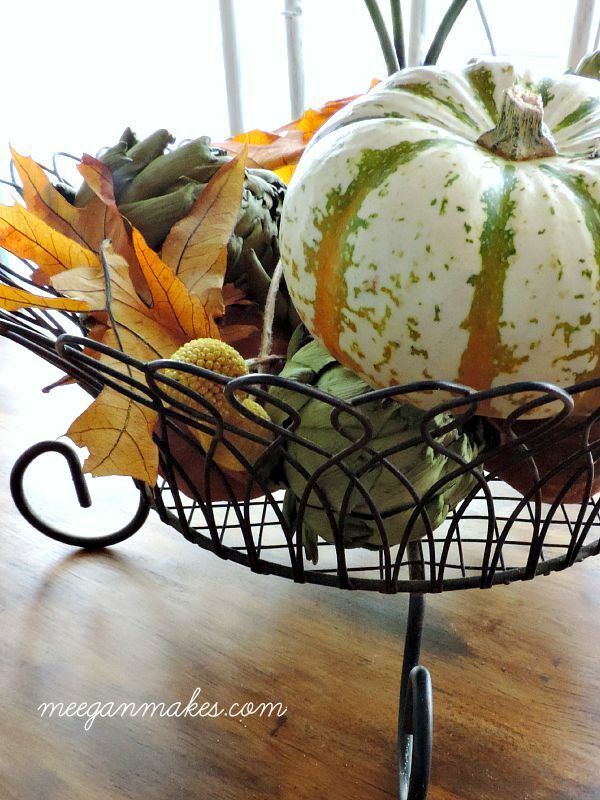 And my vintage muffin tin is a fun way to add creativity to a tablescape or tray. The candles fit perfectly in the cups. 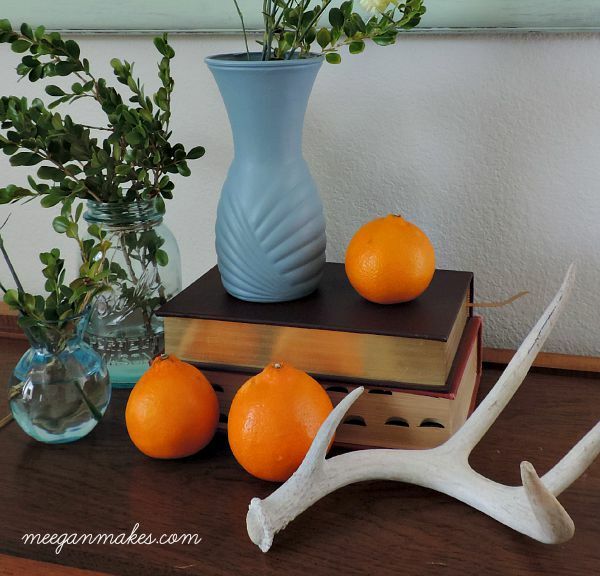 I love blue, so my Fall decorating always includes touches of blue here and there. 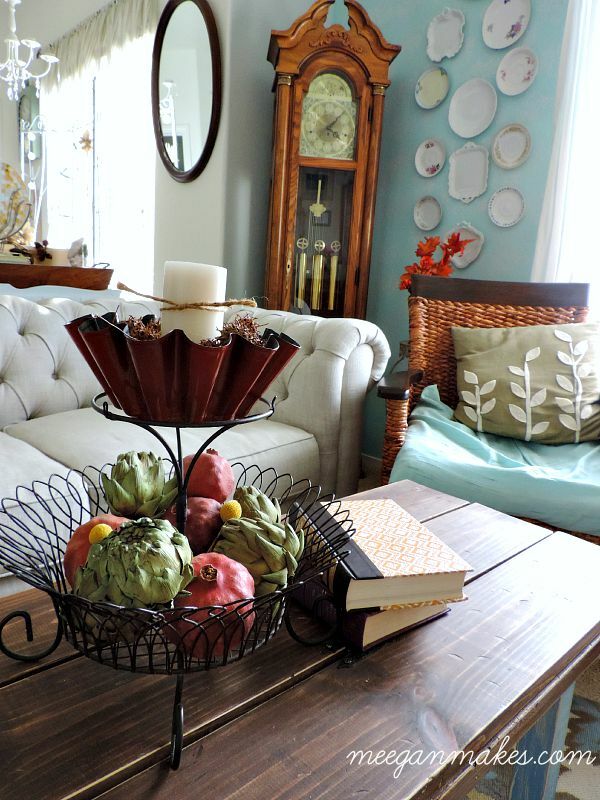 I pull out my pecan and pine cone garland for Fall decorating and sometimes use it through the first of the year. 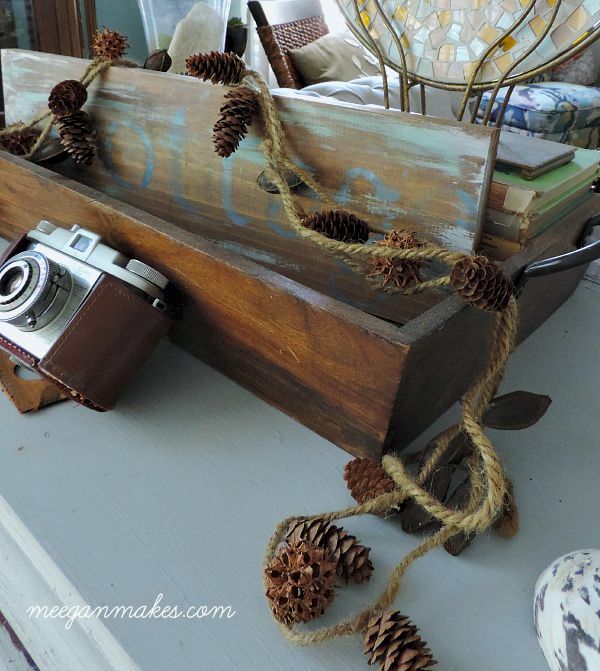 Another way to use pine cones. I placed them in peat pots and spray painted them metalic gold. 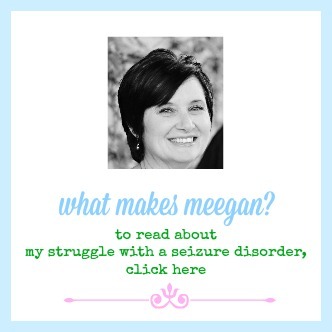 It was actually featured on Huffington Post last year. Like I said, I like to keep blue tied in somehow. Adding real fruits and veggies adds texture and variety, as I did with these tangelos. 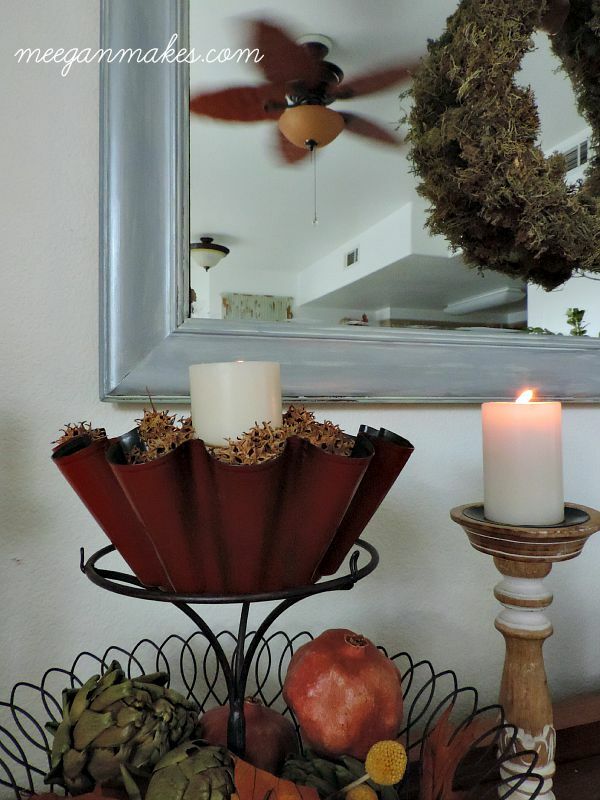 After I purchased a thrifted tiered basket and fluted pan, I added pomegranates and artichokes to make a centerpiece. 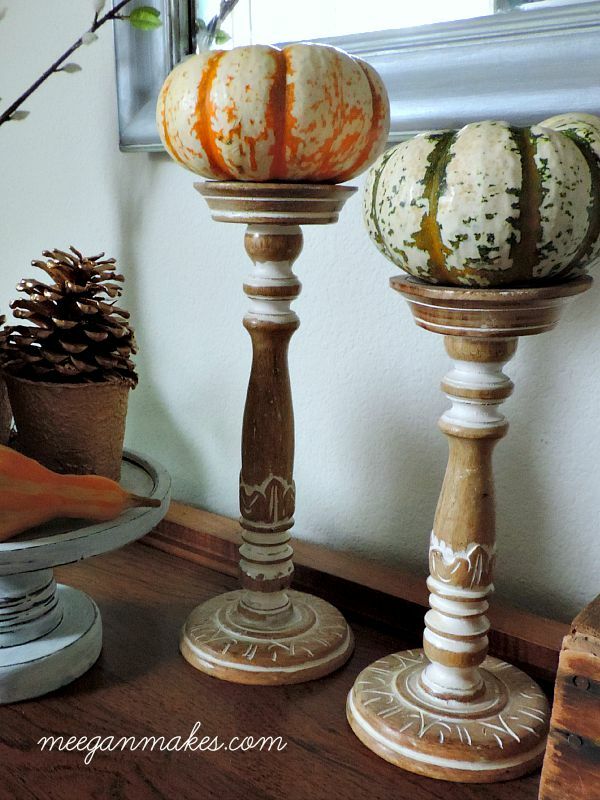 Pumpkins on candle sticks are one of my fave ideas. Especially the pumpkins with variegated colors. For a fun and unique idea on my tablescape, I dipped the handles of my flatware in Fusion Mineral Paint. I am excited for my family and friends to see! I couldn’t have been more thrilled when I was walking back from a swim when I spotted this nest under a pine tree. It was empty, in perfect shape and a great size for a pumpkin to find a home. How come everything looks so much better under glass? 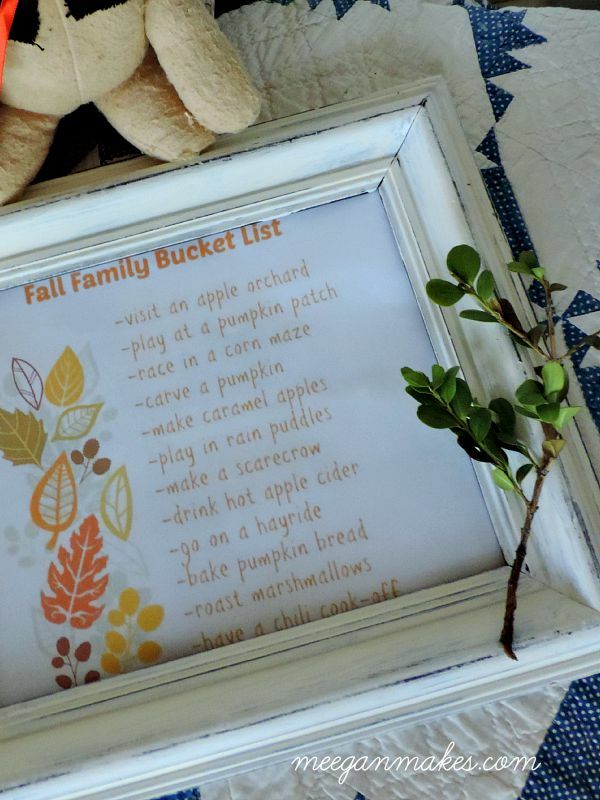 A Fall Family Bucket List is always fun for any family. 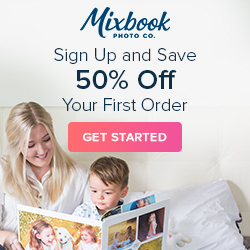 You can have a FREE copy by right clicking the picture and pressing PRINT. It is my Fall gift to you. 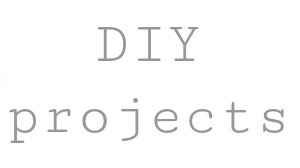 I will be sharing how I made my book page and burlap garland next Tuesday, I hope you will join me then. 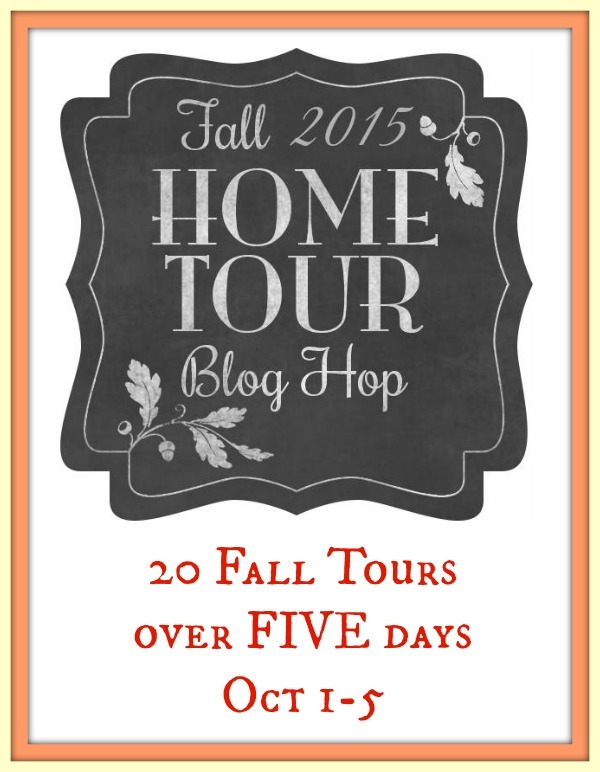 Thanks for joining me in my Fall Home tour. 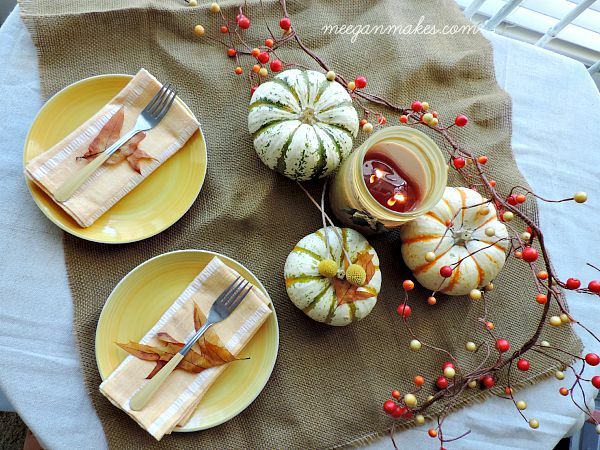 I hope you were inspired to create your own Simple Ideas For Fall. It doesn’t have to be a lot of work. Just use what you have and enjoy the process. I’m Patti hopping over from Garden Matter. Anyway, I just wanted to say I loved touring your home. 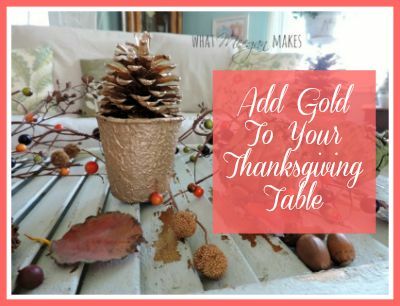 Blue is my favorite color too but what I like most about your fall decor is the way you used natural elements and re-purposing items to use around the home. Have a great weekend. I’m looking forward to seeing what everyone else has done in their homes. 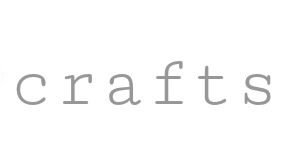 So inspiring and really gets the creative juices flowing. 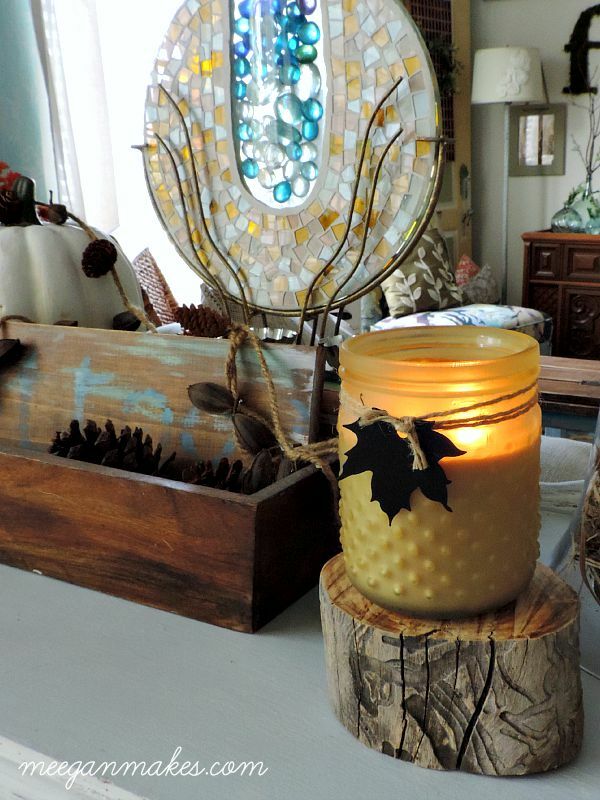 Love love love your fall touches! 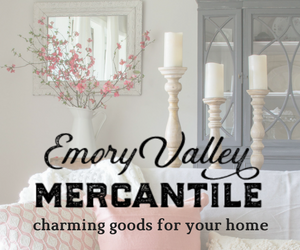 So fun, warm and cozy! 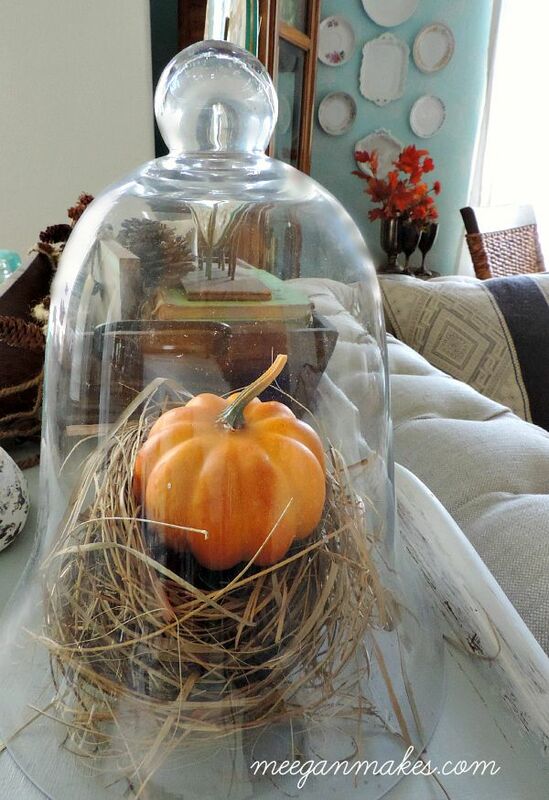 I love all of it, especially the nest under the glass! So much fun! 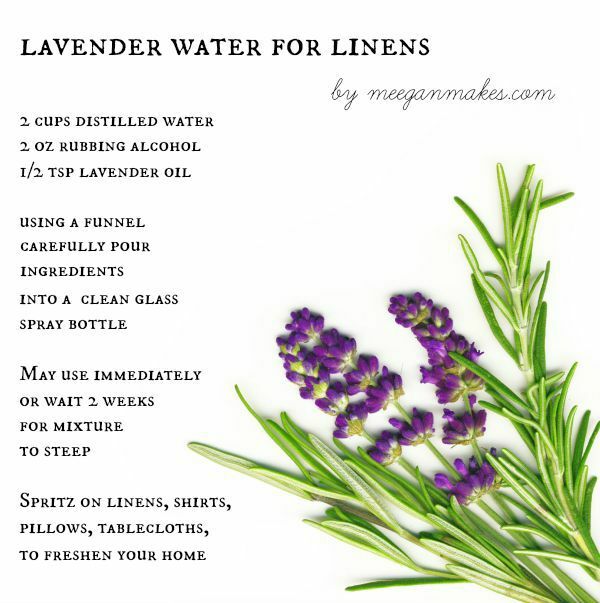 Thank you for the free printable! I love the bucket list! 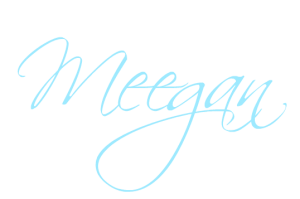 Love your tour Meegan! 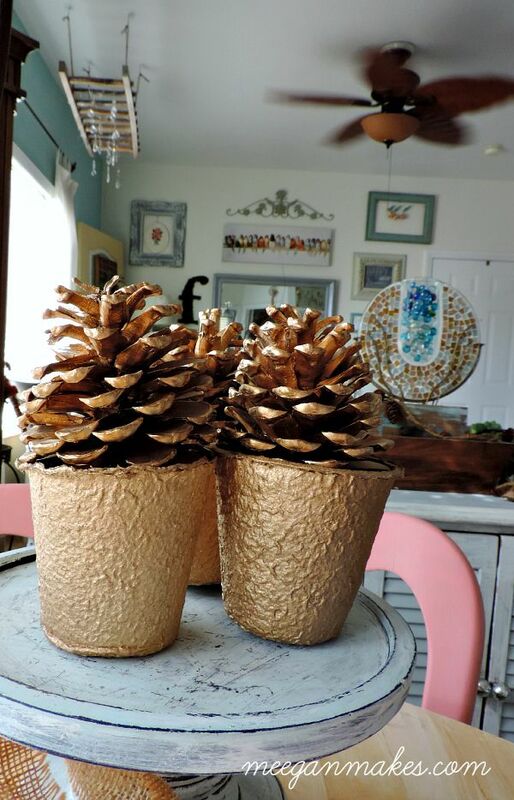 The gold pine cones in the gold planter cup was my favorite. 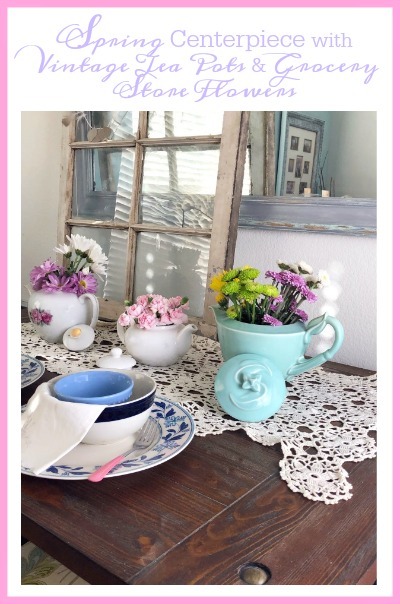 I saw your periscope a while back on those planter cups and it’s so nice to see them incorporated into your decor. 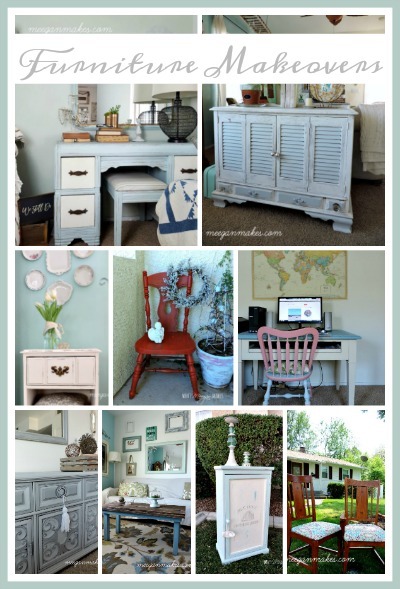 Everything looks wonderful! 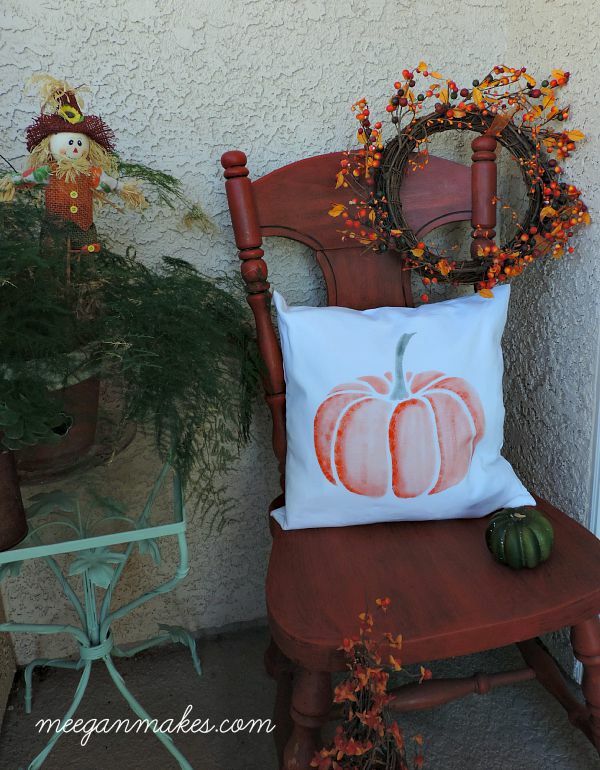 Love the cute lil scarecrows you’ve used! Gorgeous!! 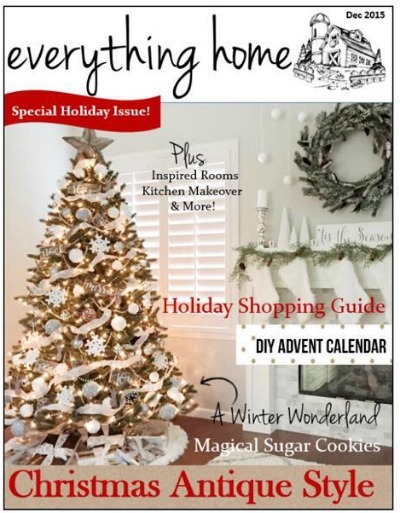 I love all of your décor and the book page banner is my favorite. 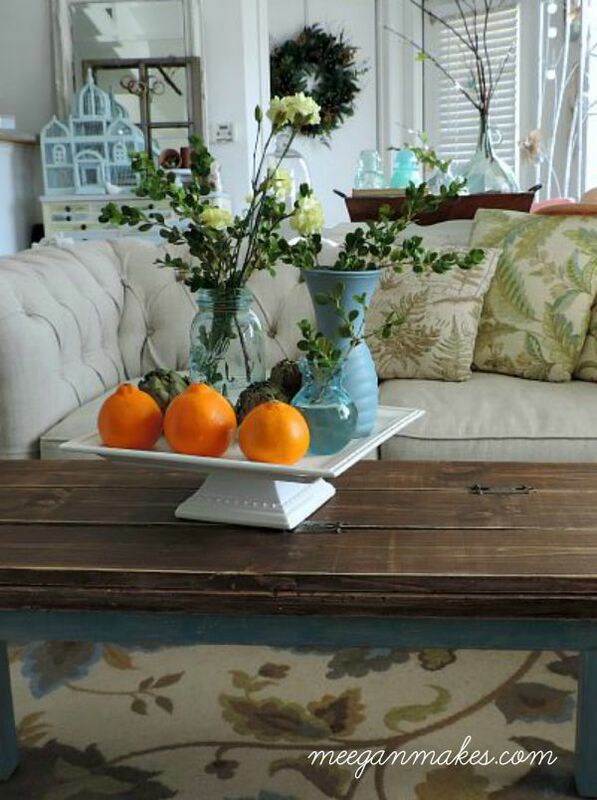 The vintage meets rustic goes great together! I see we have the same love of blue in common. 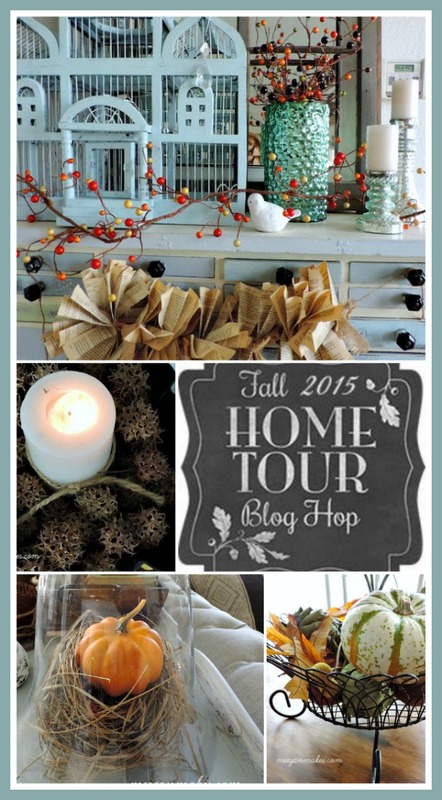 I love all the natural elements you used to decorate for fall and I really love your pinecone garland. You gave me an idea as to what to do with all my pinecones. 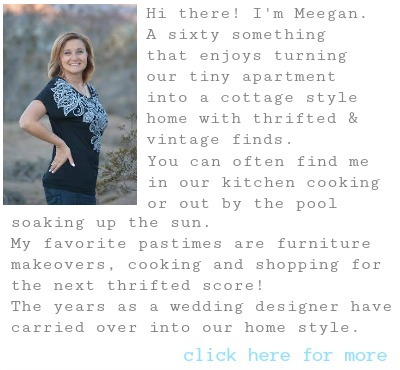 I think we have a lot in common…Thank you for the inviting home tour. Gorgeous! 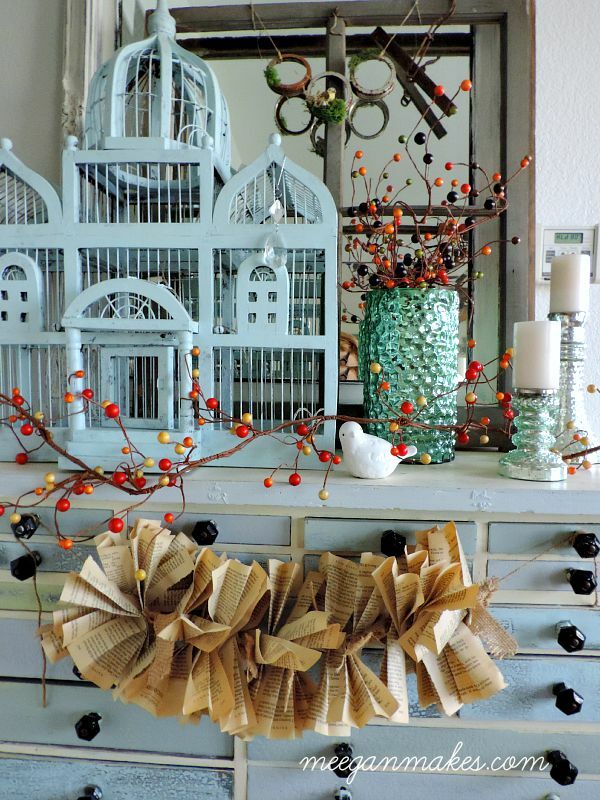 That bird cage is awesome and I love the candles in the old tart tins! Your home looks so warm and cozy. 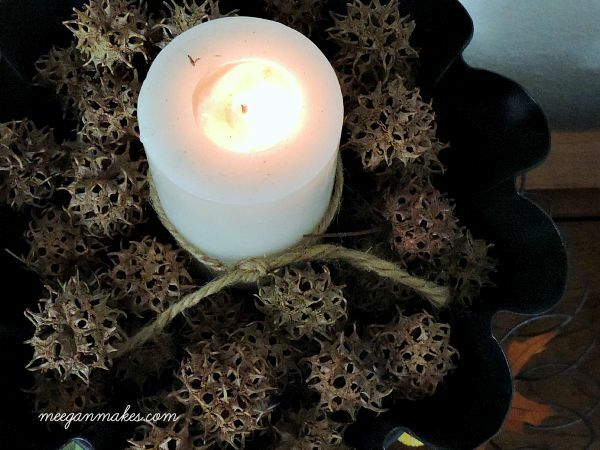 Love the tin leaf garland on the candle (perfect finishing touch) and the pine cone garland.